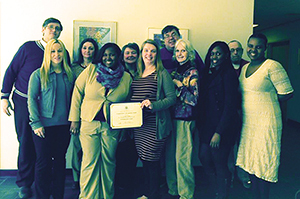 The Kennedy Center, one of the largest rehabilitation agencies in Connecticut, was recently recognized by the Department of Mental Health and Addiction Services (DMHAS) for achieving Exemplary Fidelity status in 2014. Only five of the 30 funded programs in Connecticut attained a score of 115 or above. In addition, The Kennedy Center received the highest score of any agency that qualified in Fairfield County. Kennedy Employment Services (KES) specializes in recruitment assistance and retention support, which are offered at no cost to employers. A team of professionals select and present area businesses with the best candidates for the job. In addition, KES offers incentives such as on-the-job training, working interviews and work evaluations. Companies may receive up to a $2,400 Federal Tax Credit for hiring an individual from KES. For example, Wal-Mart has saved millions of dollars in Federal Taxes through the use of this incentive.